Patrick Derrickson has been a fan of speculative fiction from the age of nine when he first read The Stand, by Stephen King. Since then, he has been the majestic hero of kingdoms, galaxies, and unspoken horrors. A member of the Written Remains Writer’s Guild, he has finally found the outlet for the bizarre thoughts chasing each other inside his head. His publishing credits include "The Next King," published in the anthology ,Someone Wicked; "The Repo Girl," published in Insidious Assassins; and "The True Enemy," published in the All-Out Monster Revolt Magazine. Patrick is a soccer referee, tracks technology obsessively, and follows too many podcasts. He lives in Delaware. Visit his website at patrickderrickson.com. 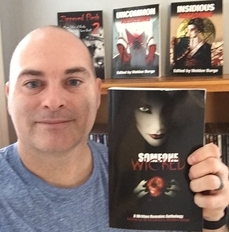 Patrick's story, "The Next King," was published in Someone Wicked: A Written Remains Anthology. His story, "The Repo Girl," appeared in Insidious Assassins. His story, "Finding Resolution," was published in A Plague of Shadows: A Written Remains Anthology.